This can be after a number of different manufacturing techniques such as drilling, forging, stamping, molding, machining, or just about any other form of material manipulation that leaves behind a rough and unfinished surface. 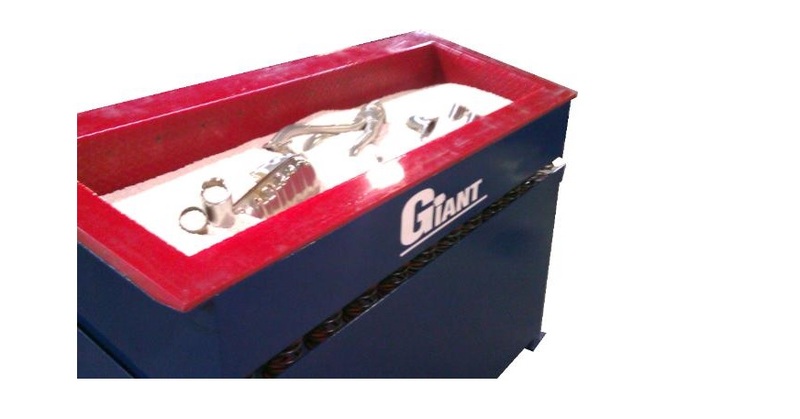 Deburring Machinery – Giant Finishing, Inc. The reason being that these processes often leave behind a raised edge, sharp edge, bump, burr or seam that can sometimes interfere with the overall task of the object. This interference could lead to operational damage, or even injury. This is why having proper deburring machinery is crucial for a wide range of industries and applications. There are a number of different processes at play within deburring machinery, from buffing and polishing to vibratory finishing. All of which are utilized in order to remove any burrs or imperfections on the surface of a part or product. Deburring machinery itself is a rather broad term as you can find large, industrial sized machinery all the way down to small hand-held pieces of machinery which get the job done within certain applications. These hand-held tools are great for products or intricate parts which are rather fragile and would risk damage by going through an industrial sized deburring machine which has everything from wheels to belts and vibratory tools. Deburring works on a wide range of materials from metals to even wood, no matter what material you are working with it is important to achieve a smooth finish in order to prevent injury and ensure that the product will be able to perform within its own application to the best of its abilities. No matter your application, speak with a knowledgeable deburring machinery manufacturer in order to better understand what type of deburring machinery is the best fit for your application based on your individual needs and specifications. This simple process can mean the difference between a good product and a great product, so it is important to get the right deburring machinery for your application, whether it be an industrial sized machine or simply a hand-held tool to use with small products. Deburring Machinery Deburring machinery are machines that are used during the secondary machining process in order to achieve a smooth final surface.